The Gravity Probe B confirmation of Einstein's theory of general relativity blanketed the news media at the end of last week. [1-7] The "Einstein brand" still has popular appeal, so it was nice that this physics experiment had a larger audience than most others. The object of this article is a description of the instrumentation behind this measurement. 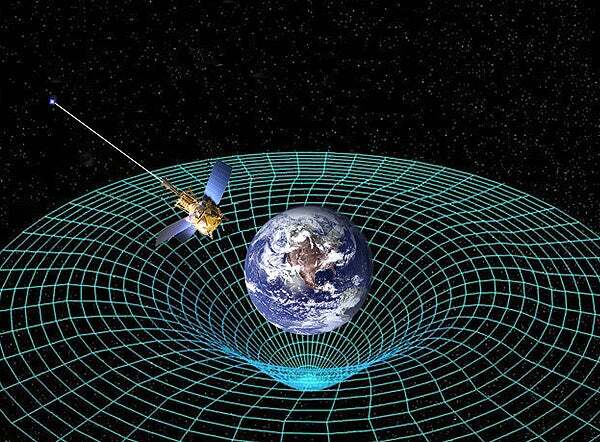 The Gravity Probe B experiment actually confirmed two predictions of general relativity. The first is confirmation of the warping of spacetime around a lump of matter, the so-called geodetic effect. This wasn't the first confirmation of this effect, as you will read later, but it's more satisfying. We've seen so many representations of this (see the figure) that it's old hat. The second effect is much more abstruse. It's the principle that a spinning object will pull spacetime with it as it rotates with respect to the "fixed stars," something that's called frame-dragging. It's a lot like rotating your spoon in a milkshake. The milkshake spins along with it. The first experimental test of general relativity was done by Sir Arthur Eddington and his colleagues nearly a hundred years ago, in 1919. Since general relativity concerns gravitation, Eddington set his sights on the biggest ball of matter in our neighborhood, the Sun. As a test of general relativity, he decided to look for deviations in the straightline paths of light rays from stars as the light rays skirted the orb of the sun. You can't see stars near the sun unless there's an eclipse, so Eddington and his team traveled to Príncipe, and island off the west coast of Africa, to photograph the solar eclipse of May 29, 1919. This was quite an adventure in those days, but the photographs were taken, and the data analyzed. The data analysis confirmed general relativity. As you can imagine, data analysis was difficult in those days. Anyone who's worked with chemical photography knows that a stellar image is contained in a small, fuzzy cluster of silver grains. It is somewhat subjective as to exactly where the center of the star really is, and the light-bending effect is small. There have been some who have said that Eddington "fudged" the results to give Einstein his confirmation. A modern reanalysis shows that Eddington's experiment properly confirmed general relativity. The Earth is a lot less massive than the sun, so spacetime bending in our neighborhood is small. Gravity Probe B measured these small variations using gyroscopes. The Gravity Probe B gyroscopes weren't ring laser gyros, which are not accurate enough for this experiment. They used the tried-and-true spinning mass approach, somewhat like a child's toy gyroscope. In the Gravity Probe B case, the spinning masses were perfectly machined 1-1/4 inch spheres of fused quartz. Quartz glass was used, since it it stable over the large temperature range required, and it's hard enough to take a good polish. NASA Gravity Probe B gyroscope. The spherical rotor is a niobium-coated fused quartz sphere. The quartz spheres, which were homogeneous to 2 ppm (parts per million), were polished to better than 300 ppb (parts per billion) in radial dimension. This was necessary to attain the 0.5 milliarcsecond per year pointing accuracy required for the measurements. The geodetic effect is 6.6 arcseconds per year, but the frame-dragging is only 14 milliarcseconds per year. The spin axes of the gyroscopes were initially pointed at the star, IM Pegasi (RA 22h 53m 02.2659s, Decl. +16° 50' 28.298"), using a telescope that was rigidly mounted on the gyroscope housing. The quartz spheres were coated with a 1,270 nanometer layer of the superconductor, niobium, and the gyroscopic motions were sensed using SQUIDs (Superconducting QUantum Interference Devices), which detect very small magnetic fields. A spinning superconducting sphere generates a magnetic moment, called the "London moment," since the superconducting electrons lag the metal lattice. 645 gallons of liquid helium were required to keep everything cold enough (1.8 K) over the course of the mission. If the general relativity effects were not present, the spinning spheres would point indefinitely at the guide star. Their changes in spin orientation confirmed the geodetic and frame-dragging effects. Six electrodes kept each spherical rotor levitated in its cavity, and a stream of helium gas was used to spin the gyroscopes to about 4,000 rev/min. The gyroscope chamber was then evacuated, and the gyroscopic spheres were left floating and spinning in space. They would remain spinning for about 15,000 years, all other things being kept constant. "One of the reasons is that general relativity, in contrast to popular belief, is actually a fairly weakly tested theory. It's a foundational theory but not well tested, so we have to test it. It is a counter-intuitive and strange theory in some ways, so certainly scientists are compelled to test it. The feature we are measuring with GP-B, the frame dragging effect, has never been measured or tested before." Jonathan Amos, "Gravity Probe B confirms Einstein effects," BBC News, May 4, 2011. Stanford's Gravity Probe B confirms two Einstein theories, Stanford Report, May 4, 2011. NASA, Gravity Probe B Results Web Site. Gravity Probe B Webcast: Mission and Science Q and A.
F. W. Dyson, A. S. Eddington and C. Davidson, "A Determination of the Deflection of Light by the Sun's Gravitational Field, from Observations Made at the Total Eclipse of May 29, 1919," Phil. Trans. R. Soc. Lond. A, vol. 220, no. 571-581 (January 1, 1920) pp. 291-333. Daniel Kennefick, "Not Only Because of Theory: Dyson, Eddington and the Competing Myths of the 1919 Eclipse Expedition," arXiv Preprint Server, September 5, 2007. Linked Keywords: Gravity Probe B; Einstein; theory of general relativity; experiment; physics; spacetime; matter; geodetic effect; rotation; fixed stars; milkshake; Sir Arthur Eddington; gravitation; Sun; light ray; star; eclipse; Príncipe; Africa; astrophotography; Solar eclipse of May 29, 1919; silver; grain; fabrication; fudged; Earth; gyroscope; ring laser gyroscope; sphere; fused quartz; temperature; polishing; polish; NASA; Don Harley; homogeneous; radial dimension; milliarcsecond; IM Pegasi; right ascension; RA; declination; telescope; superconductivity; superconductor; niobium; SQUID; Superconducting Quantum Interference Device; magnetic field; London moment; electron; metal; lattice; liquid helium; Kelvin; K; electrode; helium gas; rev/min; vacuum.